Natalie Park is a Biology major attending the University of Kentucky, but is originally from Chicago, IL. Natalie first joined our team as an Animal Care Intern in February 2017, and since completing her internship has become a regular On-Site Volunteer. 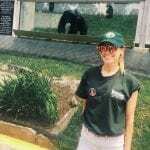 After graduation, Natalie plans to either work in wildlife conservation or become a caregiver at a sanctuary or zoo. In her free time, she enjoys listening to music, going to the mall, watching the Bachelor, and spending time with her rescued Cockatoo bird.